I’ve been wanting to do book reviews for a while to spotlight the great books I’m reading, but I wanted to lean my reviews toward writing and editing and couldn’t come up with quite the right format. Until I had a sleepless night during the Texas Library Association convention in Houston earlier this month and inspiration struck. So here’s my first Three Cs Book Review, Three Cs for Character, Conflict and Concept. In each review, I’ll focus on these three — very important — aspects of a book. In my first Three Cs Book Review, I’m thrilled to be picking apart The Sinister Sweetness of Splendid Academy, the debut novel by the wonderful Nikki Loftin and a fun middle-grade adventure. First a little about the book. Sinister Sweetness follows Lorelei as she starts a new school, Splendid Academy, which was practically built overnight after her old school mysteriously burned down. Splendid Academy looks to be too good to be true, with bowls of candy on every desk, optional homework, gourmet meals served by waiters in the cafeteria and the best playground any kid could want. When her new friend Andrew goes missing, Lorelei must solve the mystery about the school and take on their beautiful teacher, who’s really a witch. , Barnes & Noble and Indiebound, among others. Writing in the first-person point of view of Lorelie, Nikki has done a great job of letting readers see the space the character’s in from her perspective. We don’t just get descriptions, we see everything through Lorelie’s eyes and understand how it feels from her emotions. Notice how she doesn’t just describe the lettering, but how Lorelie reacts to it, and what that L reminds her of tells us a little about the character. Nikki changed the witch of the gingerbread house into a teacher, a beautiful, kind teacher who lulls Lorelie into her sinister plans. So, teachers who eat children and children enticed by a fabulous, shiny new school? High-concept indeed. Character: The main character, Lorelie, is a determined yet self-conscious girl. Like many of us, she’s trying to figure out who she is and her place in the world. But for her, the dilemma is made worse because her mother died and she now has to accept a step-mother into their family. This is where Nikki does a great job of delving deeper into the characters. Lorelie isn’t just a girl enticed by a gingerbread house type of school. She’s also a girl who desperately misses her mother — a fact known all too well by Splendid Academy’s evil teacher. It adds an addition layer to the Lorelie as a character and to the story as a whole. And the writing gives us a clear view of Lorelie’s personality, a strong voice that we can hold onto and follow throughout the book. The other main character of the story, Andrew, is also not two-dimensional. Facing childhood obesity, Andrew understands that food isn’t always your best friend, and when Splendid Academy puts whatever the children want on the menu, he becomes suspicious. Not stereotypical, Andrew is smart and brave, although underappreciated by many of the children. And his strength helps Lorelei when times get tough. All of Nikki’s characters are well-rounded, from Lorelie’s dad, who’s loving but pre-occupied with his new wife, to her best friend Allison, who’s taken in by the splendor of the school. Conflict: With a school that calls to children and a witch who wants to eat them, this novel is obviously stuffed with conflict. But from that basic Hansel & Gretel inspired idea, Nikki took the story a step further, giving it more depth with other issues from the characters. And she’s not getting along with her stepmother Molly and struggling with the fact that her father has asked her to welcome Molly into the family. But to really pile on the conflict, Nikki shows us that Lorelie is unhappy with herself. As much as she tries to be a good daughter, sister and best friend, she believes she’s a horrible person because she killed her mother. Whether this is true or not isn’t important — the answer is in the book, and I’ll let you find out for yourself — what’s important is that the character development adds extras layers to this story and to the character. Even if readers don’t feel that they’re responsible for their mother’s death, they all have felt at least one time that they weren’t enough. We can empathize with Lorelie and understand how her pain affects the decisions she makes that drive this story. 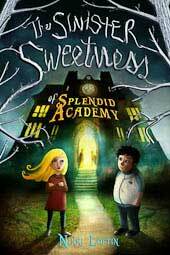 Overall: The Sinister Sweetness of Splendid Academy is a fun and inventive story, a re-imagined fairy tale that’s entertaining throughout. Like many of the best fairy takes, it has dark undertones, but nothing that’s too scary for the middle-grade audience it’s intended for. And it has enough depth to keep older readers happy too. I highly recommend this novel both for pleasure reading and as learning reading for writers. Fantastic review of a fantastic book! whoa, what a concept! Sounds great. Thanks for the mg review!